Downtown Los Angeles is a fascinating case study in urban revitalization. At the beginning of the 21st century Downtown LA was in horrible shape. The area was blighted and full of homeless people pushing shopping carts and camping in tent cities on the sidewalks. It was filthy, crime-ridden, and accordingly it was a ghost town after work hours when the office crowd went home. Gorgeous architectural buildings sat empty and decaying. It was a sad sight to behold, but Downtown would not be down and out for long. Beginning in the 2000's, Downtown LA began an aggressive revitalization program, the culmination of many initiatives to restore this once great city back to her previous glory. Short story, it worked. Things happened quickly as Downtown's massive potential became realized once again. The city shed its gritty, grimy cocoon and emerged as a beautiful urban butterfly. Restaurants, eateries, pubs and nightlife opened in formerly abandoned retail spaces and art walks brought hundreds of people out at night. Streets formerly occupied by panhandlers became overrun with a new and hipper crowd walking dogs, or enjoying a morning latte. Most importantly, the old neglected buildings were restored back to their original glory. 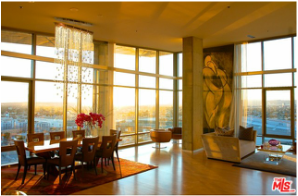 Many of these were converted from office or industrial spaces into loft dwellings designed for chic urban occupants. 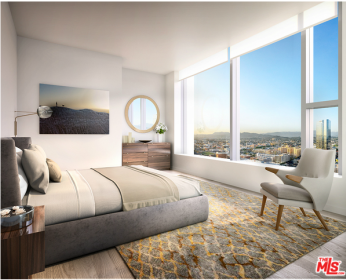 These units sold quickly which brought an influx of people, which led to more businesses opening up to serve the new crowd, which led to more people wanting to move in, which snowballed into a housing rush Downtown. In 2000 there were 27,000 residents. In 2013 there were 52,000. The area was massively cleaned up as a result with a major reduction in crime and urban decay. Downtown LA’s renaissance was a spectacle to behold and it has left Los Angeles with one of the most exciting urban cores in the world. GQ magazine recently called Downtown LA America's Next Great City. Eastern Columbia building, one of the best residential conversions in Downtown LA. 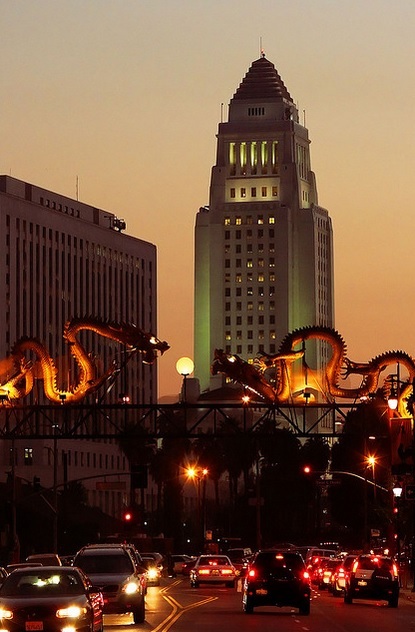 Downtown Los Angeles is one of the oldest established cities in California. Los Angeles has always been a prosperous place and a hub of commerce, always attracting many different kinds of people. There are archaeological remains dating back to 8000 BC from the Chumash people. Later a sea-faring people called the Tongva came to the region and became the dominant group for centuries. The Tongva were mostly peaceful and prosperous, hunting sea mammals, trading and farming the Los Angeles basin which they called Yaa or Yang-Na. The center of this region was located near what is today Los Angeles City Hall. Tongva population could have been as high as 10,000 when the first Europeans encountered them in 1542. Juan Cabrillo of Portugal navigated the coast of California and when he sailed into the San Pedro Bay on the south side of what is now Long Beach he named it “Bay of Smokes” because there were so many camp fires from Tongva villages. 166 years later the Spanish came to the area and brought the Mission system and knowledge of agriculture that would change the landscape of California. In 1769 Gaspar De Portola established the first Spanish settlement right on the LA river which he named “Rio de Nuesta Senora la Reina de Los Angeles de Porciuncula” The name was quickly abbreviated to Los Angeles and the settlement flourished. The Spanish founded a mission in San Gabriel in 1771 and established the first large scale European foothold in Southern California. The man most responsible for the founding of Los Angeles was Felipe De Neve of Spain. He was named the governor of California and toured the territory in 1777. Neve wanted to establish small “pueblos” for military and trading purposes. He chose three sites- San Jose, Santa Barbara and Los Angeles. The city of Los Angeles was officially founded September 4, 1781 by 44 settlers, each given four plots of land, two with irrigation and two without. Spanish Ranchos of Los Angeles. 4th and Main Downtown LA in the early 1900s. Note the trolley car going North/South on Main st. The first American trading ship came in 1805 and the first commercial vineyard in California was started on the banks of the LA river in 1831. In 1846 the Mexican American War broke out. The US forces routed the Mexican Army at the Battle of San Gabriel near Downtown LA. This began the Siege of Los Angeles which lasted about a week after which the US forces were in control of Los Angeles. By 1848 the US had defeated Mexico and the war ended with the signing of the treaty of Guadalupe Hidalgo making everyone living in California a US citizen. The 1850s and 1860s were wild times in the frontier environment. Los Angeles was called “The toughest and most lawless city West of Santa Fe”. 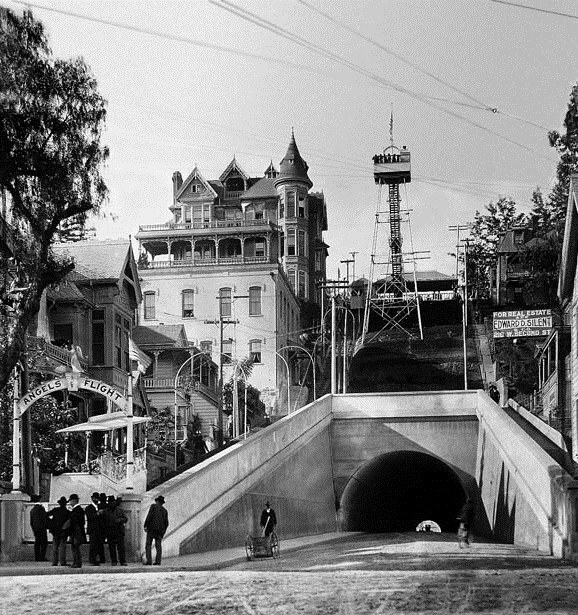 By the 1870s order was largely restored and LA began its’ meteoric rise into a mega city. Railroads and harbors were built and tourists from all over the country began pouring into the growing city. In 1892 oil was discovered just north of Downtown LA by the infamous Edward Doheny. More oil strikes followed and by the end of the 19th century LA was producing 25% of the oil in the USA. A population boom happened and LA grew from about 11,000 citizens in 1880 to almost 100,000 in 1896. The city center was moved south of the pueblo to what is now referred to as the "Historic Core". 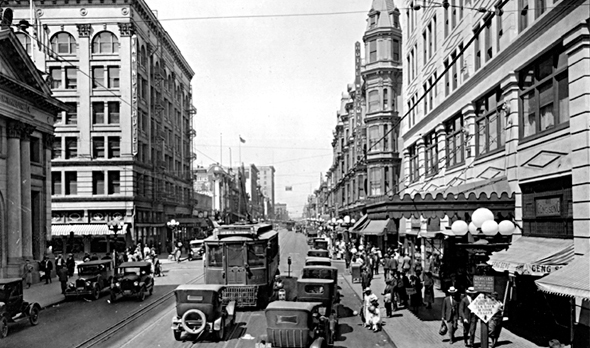 In the early 1900s Los Angeles downtown was a thriving metropolis. The city had what was the most extensive rail system in the country at the time, even larger than New York. From their headquarters on Main street Pacific Electric Red Cars went all over Southern California, from Newport Beach to Northridge and from Santa Monica pier to San Bernardino. Spring street became the banking and financial center of Los Angeles and the first tall buildings were built on this street. Broadway became the entertainment, nightlife and shopping center of the city and over a dozen classic theaters were built before 1932. Bunker Hill was one of the wealthiest residential neighborhoods in California with stately Victorian mansions lining the streets. Union Station was finished in 1939 and is still in use today. Downtown was thriving up until World War Two. 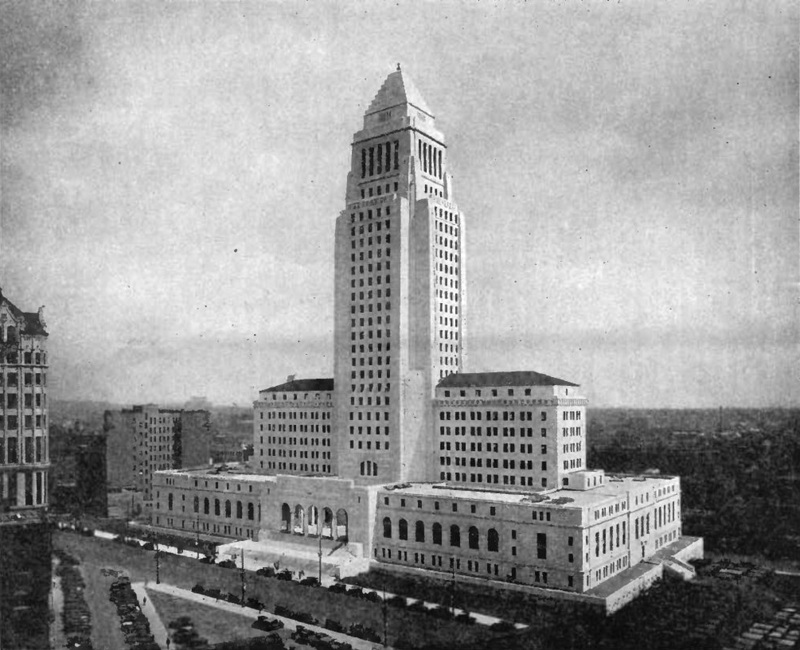 The iconic LA city hall building was erected in 1928 and remained the tallest building in Los Angeles until 1964. After WWII Los Angeles underwent suburbanization and the city sprawled outwards in all directions. The historic core was beginning to decline as businesses and people moved west toward the ocean or into the San Fernando Valley. Blight, crime, and decay set in to Downtown. The Victorian mansions of Bunker Hill were used as boarding houses for low income and transient tenants. It became more profitable to operate parking lots than maintain old buildings so many architecturally significant buildings were demolished and paved over. Others were spared the wrecking ball only to sit mostly vacant for decades. The vibrant theaters on Broadway were closed or converted to swap meets. In 1955 with the Bunker Hill Redevelopment project cleared the way for modern skyscrapers, most of which were built in the 1970s. Downtown was a place that people would drive to for work then drive out of, it was a ghost town after working hours. Downtown was not what it is today until the turn of the 21st century.